Why has the Tippmann A5 been our best-selling paintball gun since 2010? Badlands has sold thousands of them because the A5 combines great looks and customizability with Tippmanns legendary reliability and the performance of the Cyclone Feed System. 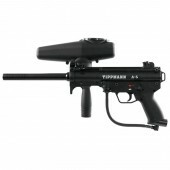 Tippmann A5 Paintball Guns There are 3 products. The A5 is a great choice for someone looking for an incredibly reliable marker that offers the speed and anti-jamming performance of the Cyclone Feed with the most customizable scenario gun platform out there.